I am a huge proponent of babywearing and all it's benefits. I've used stretchy wraps, ring slings and structured carriers with both of my children and I was very pleased with the Wrapy. Wraps can seem intimidating when you unfurl the length of fabric, but the Wrapy created a great visual instruction manual with the product. It's easy to follow for inexperienced moms and a quick reference guide for those of us who need a refresher! 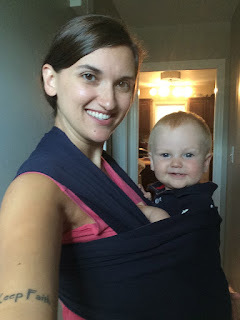 Who doesn't love the snuggles you get from babywearing?! The Wrapy was very comfortable and flexible. Whatever your shape and body type, it can be adjusted to suit your body without any straps or clips to press against you. I like how soft the fabric is on my skin and my son's skin. It comes with a handy drawstring pouch for storage when not in use. Babies truly feel as if they are being cradled in the womb when placed in a wrap, and it gives moms the ability to use their hands for other tasks while providing comfort to their babies. If you are in the Lexington area and need help with babywearing, check out the Bluegrass Babywearers on Facebook.